Stamp set found on page 15 of the Occasions catalog. BONUS CARD due to this darling stamp set & In Color paper used both retiring May 31. Paper while supplies last. Stamp set only guaranteed through May 22. 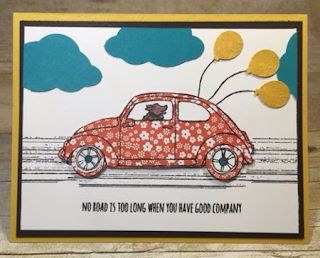 Using Memento Black ink, stamp the VW Bug Car image onto a piece of Tangelo Twist DSP from the In Color 2014-16 Paper Stack. Stamp the same image on a scrap of Whisper White card stock. Using the dog image, stamp inside the “driver’s” window of the car that was stamped on Whisper White. Cut out the image stamped on the DSP and set aside. Next, cut out both windows from the car image on Whisper White and adhere them onto the car on the DSP. Using the ¾” circle punch, punch out both of the “wheel” sections from the Whisper White car image. Adhere them to the DSP car as shown. Take the Soft Suede ink pad and, leaving it closed, gently squeeze the top and bottom lids together to create a small pool of ink in the lid. Open the pad and, using the Blender Pen, pick up Soft Suede ink to color in the puppy in the car window. Set completed car aside. Punch three “clouds” from Marina Mist card stock using the Tree Builder Punch. Punch three small balloons from a scrap of Crushed Curry card stock using the Balloon Bouquet Punch. Stamp the image that resembles tire treads from the Gorgeous Grunge stamp set onto the Whisper White card stock layer. Make sure to leave room above and below it as shown for the punched items and greeting. Stamp the greeting below the tire treads. Next, adhere clouds as desired to the “sky” as shown. 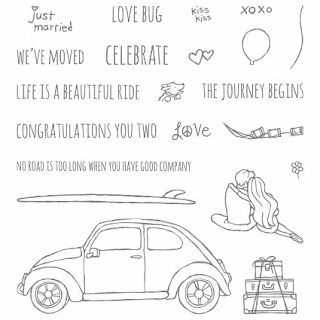 Add Stampin’ Dimensionals to the car and adhere it where you’d like it to go. Be sure to allow room for the strings of the balloons. Stamp the balloon strings using Momento Black ink. 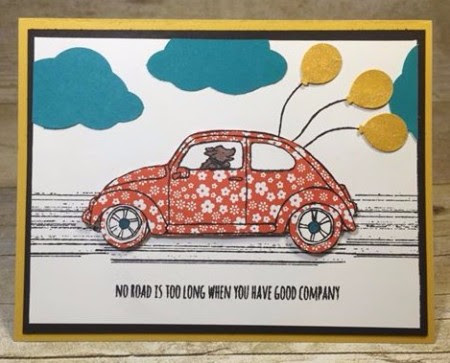 Add the balloons using Stampin’ Dimensionals to the ends of the strings. 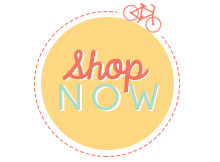 Beautiful Ride - click on the image below to enter my online store.